Source of Materials: Purdue University Library, New York Times, New York Herald Tribune, Library of Congress, Schlesinger Library (Radcliffe College), and other gathered visual materials. 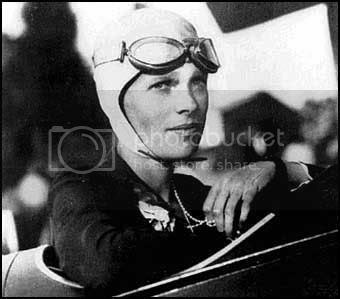 This site will include a selection of newspaper clippings concerning the life and influence of Amelia Earhart, as well as personal letters providing insight into the life of an American icon. The purpose is to explore Earhart's importance in the promotion of aviation and women's rights in the early nineteenth century. The site will be particularly geared towards children, but will be beneficial to Earhart admirers of all ages. I looked over the whole site, and it looks interesting and well-planned. Your index in particular was impressive, and highlights how much the site can accomplish. The management also seems straightforward. I have some questions that may be worth considering. For one, will there be any interactive materials for the children and students? You have a "Try Transcribing" section, but will there be anything else? I don't have any specific tools in mind, but it may be useful to think about adding something like that, considering your intended audience. Also, will focusing on children affect transcriptions or metadata in any way? Will the language and prose be altered for different passages, and do you think this will affect the history? I imagine that many of the documents were not created with children in mind, and I do not know how younger audiences would react to that. I was also curious about how you were going to promote or advertise this project. It seems that this site will thrive if a lot of people use it and provide feedback, providing additional growth and change. Do you know who you could contact or what institutions would be helpful for getting this project in use by teachers? Overall, it all looks good and interesting. May I chime in with the suggestion of employing a map that displays some of the flight routes Earhart used when she set the aviation records mentioned in the general description? Perhaps this graphical display of where and when she flew could be linked to news reports and photos related to each event? I like that your focusing on a demographic that not a lot of people do. I agree with Steve and Zach that a lot of interactive qualities would make it fun for the youth to look through the pages and learn more about historians and Amelia Earhart. For your search page, I would recommend having drop down menus or pre-selected selections since your target age range is much younger.